In early August, several of our experts in affirmative action and workforce compliance joined the federal contractor compliance community at #TheHappiestILGonEarth in Anaheim. This is the second in a 3-part series capturing what we learned from sessions led by OFCCP leaders and other compliance and diversity experts. When compliance experts gather, the focus is usually on negative consequences. Mitigating risk. Preparing for an audit. Responding to a lawsuit. Tracking trends in complaints and settlements. As much as employers need our checklists and guidance, they also want models they can emulate. They want to be inspired by programs that leap beyond compliance standards for outreach and recruiting. Programs that are successfully engaging diverse job seekers and that reflect a genuinely inclusive culture and workplace. At this year’s ILG Conference, the federal contractor and compliance community got their wish. Several companies highlighted their outreach and recruiting efforts, describing how their programs can serve as examples for talent acquisition managers seeking to amplify their programs and meet the needs of a diverse pool of talented candidates. OFCCP leaders took note of these great examples and offered congratulations. Across the board, their websites send a clear message of inclusion to diverse job seekers. Their careers sections feature diverse employees. And they showcase specific initiatives that create an inclusive environment where employees of diverse race, ethnicity, lifestyle, belief, and ability, as well as veterans can thrive. Here are 6 powerful examples of companies getting diversity outreach right. PepsiCo’s Diversity & Engagement program and career site sends a strong message about its commitment to equality and to reflecting, in its workforce, the diversity of its consumers. Of particular note is the company’s significant support for veterans and their families. For example, their veterans’ employee resource group offers specific help for vets who are transitioning from military careers and into the civilian workforce. Pepsico also sponsored an initiative developed with 40 employees with hearing impairment. Among other things, the initiative included sign language training for associates and executives. Lockheed Martin’s award-winning support for military and veteran employees includes devoting volunteer service hours to veteran initiatives and working with veteran-owned small businesses. 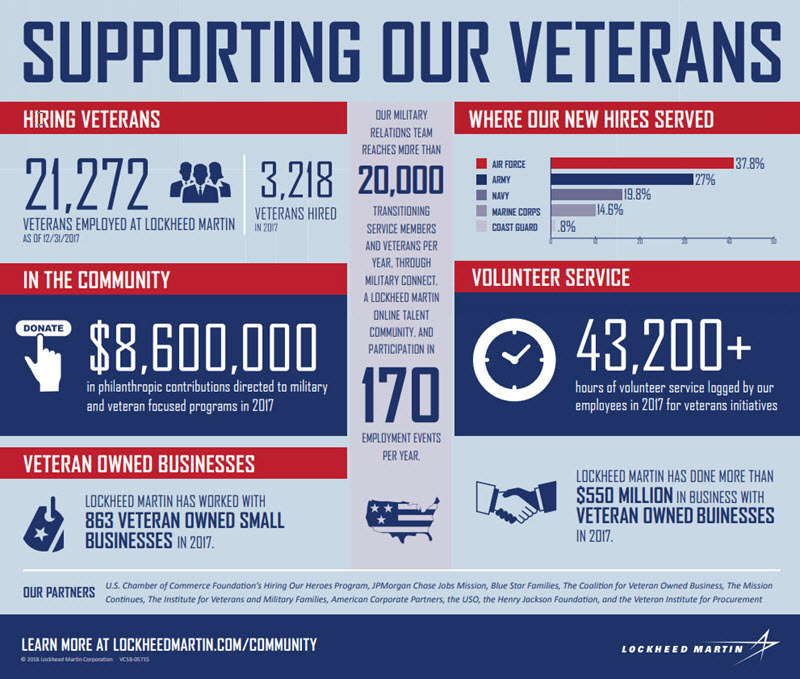 By capturing data on these efforts in an infographic, Lockheed Martin clearly communicates its commitment to employing veterans. Facebook offers a strong recruiting message for veterans, showcasing a program that includes mentorship opportunities, monthly speakers, recruiting panel discussions, and events with local and national veteran-focused organizations. Perhaps unique to their program is an initiative to offer cybersecurity training for veterans, tapping into and augmenting specialized skills that some military personnel bring to the workforce. Northrop Grumman’s careers site offers a particularly valuable example not just for federal contractors, but for any talent acquisition manager seeking to boost recruiting of individuals with disabilities. First, their statement of accommodation for individuals with disabilities is one of the best we’ve seen. It’s clearly written and prominently displayed so that people with visual and other impairments can find it and request accommodations they may need to apply for a position. 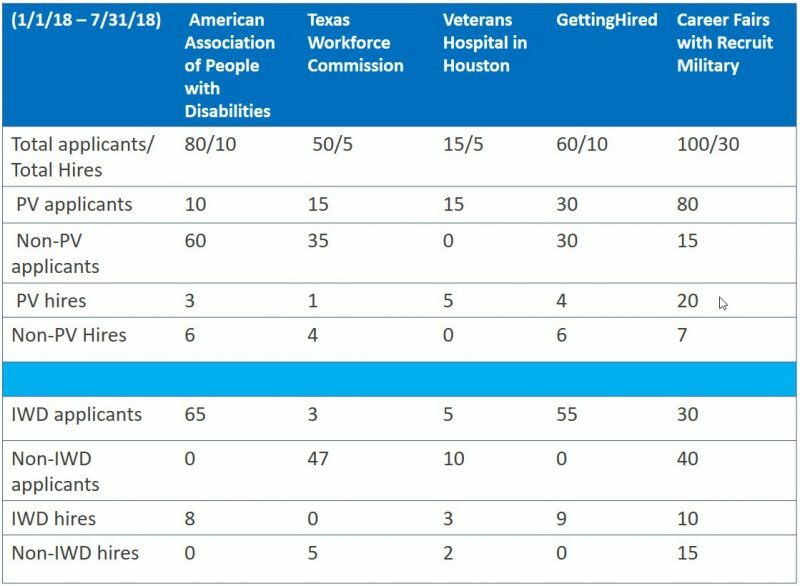 Second, Northrop Grumman posts employment statistics by job category, clearly signaling their commitment to transparency and to employing a diverse workforce. The fact that Microsoft has created a position for a Chief Accessibility Officer speaks volumes to their commitment to employing individuals with disabilities. They also have staff whose sole focus is on recruiting people with diverse abilities. Their careers page lists “Hot Jobs” for which they specifically encourage candidates with disabilities to apply. They have built accessibility into their new employee orientation. And their site showcases a number of videos—including this one that captures their unique program for placing people with autism—that emphasize the value they place on employing people with diverse abilities. Among the pillars of Ernst & Young’s diversity and inclusiveness initiative is a robust program and resource section to help employees embrace an “abilities inclusive” mindset. Harkening back to founder Arthur Young, who was deaf with low vision, EY has created several “abilities networks” to encourage dialogue, create a positive and inclusive culture, and drive innovation and client service. In prior years, OFCCP might have been satisfied just knowing you had well-defined good faith efforts or a diversity program. Now the agency requires proof that that programs are effective. No longer can employers simply list job fairs attended or websites where positions are posted to attract diverse applicants. Did the activity attract qualified applicants? Did it result in the hiring of qualified employees? Did it expand outreach in the community of interest (e.g., veterans or individuals with disabilities)? Did it increase your company’s capacity to include diverse employees in your workforce? Document each targeted activity—including date, a narrative description, and qualitative results—and capture data by source on the number of candidates recruited and hired. By tracking data and preparing routine, structured reports that document results, you’ll be able not just to prove but to build on your successes. You will also be able to replicate and expand those efforts that attract the talented, diverse workforce your organization needs—and to send a clear signal to diverse candidates that you are an employer of choice.